Only one per press needed. You need one Ram Ejector Arm per press. You don’t need a Ram Ejector Arm with each set of your dies. A Ram Ejector Arm automatically ejects the gas check from the female die once its formed. This works only in a slotted ram press. Our ejector arms work with most presses using two (2) different styles. Our LEE style is one, and RCBS style is another. (see operation instructions on how the ejector arm works).Many shooters make their own or modify their primer arm (factory arm), by removing the primer cup. Proven performers are: All RCBS Rockchuckers, RCBS Rockchucker JR., LEE Classic Cast Turret, LEE Classic Cast Single, LEE Challenger Breach Lock Single. Lyman Orange Crusher, T-Mag, Lyman Spartan. The Hornady press factory primer arms work with with the primer cup removed. 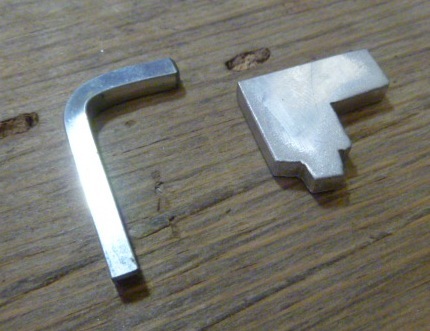 Many shooters have made up their own ejector for their model press.